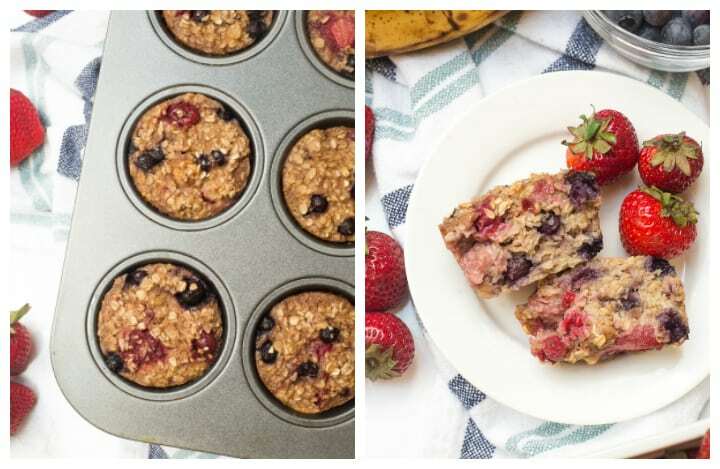 These mixed berry baked oatmeal cups are a delicious, healthy breakfast that you can prep in advance and take with you on-the-go! 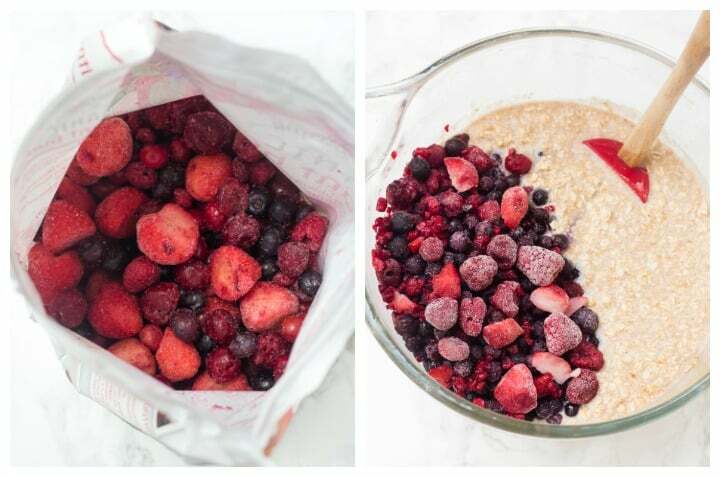 Use fresh or frozen berries, ripe bananas, and oats for a simple recipe you can whip up in 30 minutes or less. Here’s a new version of one of my very favorite blog recipes: baked oatmeal! I make baked oatmeal almost every single week as part of my loose system of meal prep, so I love trying out different recipes. In the past, I’ve shared recipes for blueberry banana, apple cinnamon, cranberry pear, and pumpkin pecan baked oatmeal. I just tested a chocolate peanut butter version, too, and it was good, but I decided I definitely prefer the fruity varieties when it comes to baked oatmeal. This is the first individual serving-size baked oatmeal I’ve made and I think these oatmeal cups are a cute, more aesthetically pleasing version of the baked oatmeal I typically make. They’re also a bit quicker since they only take about 15 minutes in the oven rather than 45+ minutes, so if you’re hoping to have breakfast on the table ASAP, these are the way to go. I usually use frozen berries since they’re available year-round, and I always keep some in my freezer. My favorite frozen mixed berry blend is from Costco. I mention this one my Instagram stories sometimes because I love it, and it’s great for oatmeal and smoothies! It’s called the antioxidant blend, and it has strawberries, raspberries, blueberries, cranberries, and cherries. But any frozen mixed berry blend would work perfectly, and of course, fresh berries would be amazing, too. The only ingredient I don’t always have on hand is the ripe bananas, but I love baked oatmeal so much that I typically buy bunches of bananas for the sole purpose of letting them get speckled enough to use in baked oatmeal. 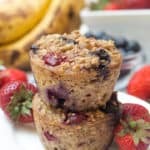 The batter takes about 10 minutes to make, and then after 15 minutes in the oven, these baked oatmeal cups are ready! As you can see, I like mine on the gooey side so I take them out of the oven when they’re barely brown on top, but you can leave them for an extra minute or two. Once they cool, I place the baked oatmeal cups in a glass Tupperware container. To heat them up later, I’ll either toss them in the microwave for about 15 seconds, or pop them in the toaster oven while I make the rest of my breakfast. Oh, and I love having these with scrambled eggs. Eggs are great for protein and staying power, but they’re not the most satisfying meal to me on their own. 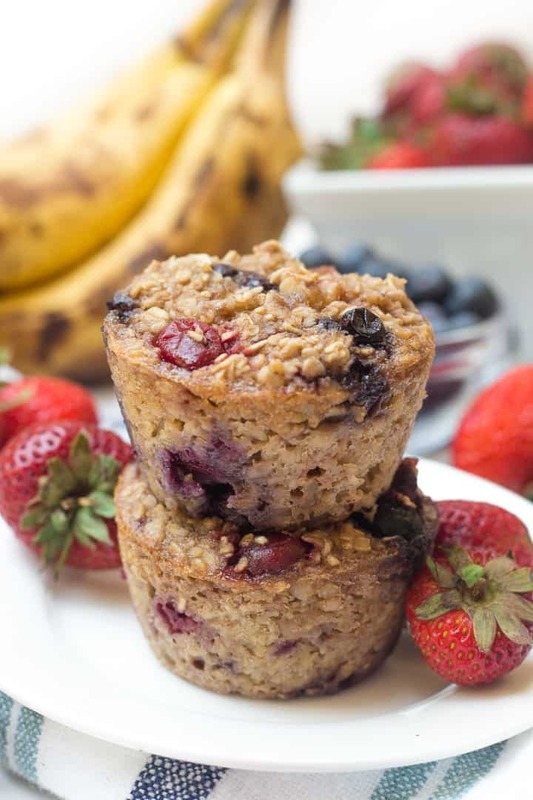 So, then these baked oatmeal cups add a healthy touch of sweetness and satisfying carbs. They’re also a great snack on their own, and you could add a drizzle of almond butter to take them over the top! If you try these mixed berry baked oatmeal cups, let me know in a comment or take a photo and tag me @livbane on Instagram! I’d love to see! 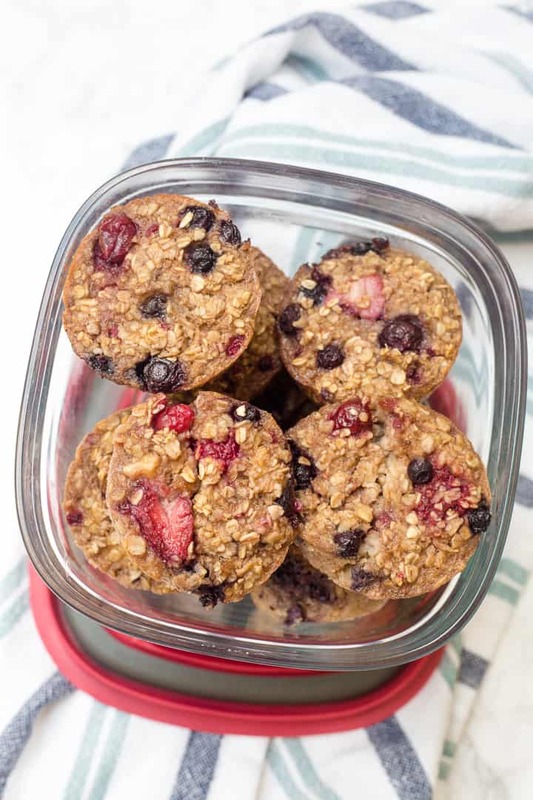 These mixed berry baked oatmeal cups are a delicious, healthy breakfast that you can prep in advance and take with you on-the-go! Preheat oven to 375 degrees. In a medium bowl, mix together the oats, baking powder, cinnamon, and salt. In a large measuring cup, whisk together the milk, honey, eggs, vanilla. Add liquid mixture to dry mixture in the bowl and stir to just combine. Drizzle in butter or coconut oil while stirring, then add mashed banana, blueberries, and nuts. Spray 12 muffin tins with cooking spray. Distribute batter evenly into tins and bake for 17-20 minutes, or until the baked oatmeal is just starting to brown or a toothpick inserted in the center comes out mostly clean. Let cool for at least 10-15 minutes before removing from pan and then serve. Refrigerate leftovers in a storage container for up to 5 days, reheating in microwave or toaster oven before serving. My son has an egg white allergy. What would you substitute the egg with? Applesause? He love berries AND oatmeal but doesn’t use a spoon yet and oatmeal is messy so a nice muffin would be great! Hi, Carmen! Have you ever tried making a “flax egg” with 2.5 Tbsp. of water and 1 Tbsp. ground flax seed? That’s what I’d recommend substituting to be most similar! You mix those two ingredients together and let it sit for a few minutes to thicken, and then it acts as a binder, similar to an egg. I also mistakenly left the egg out once (oops!) and the recipe still turned out well. Baked oatmeal is forgiving! These can be frozen and reheated! The texture isn’t exactly the same, but they’re still great. I like to reheat them on a paper towel after I freeze them to absorb any liquid from being frozen. Can these be made with rolled oats instead of quick cooking? If so, is the recipe the same? Hi, Shannon! Yes, they can be made with regular old-fashioned oats; they’ll just be a bit chewier!